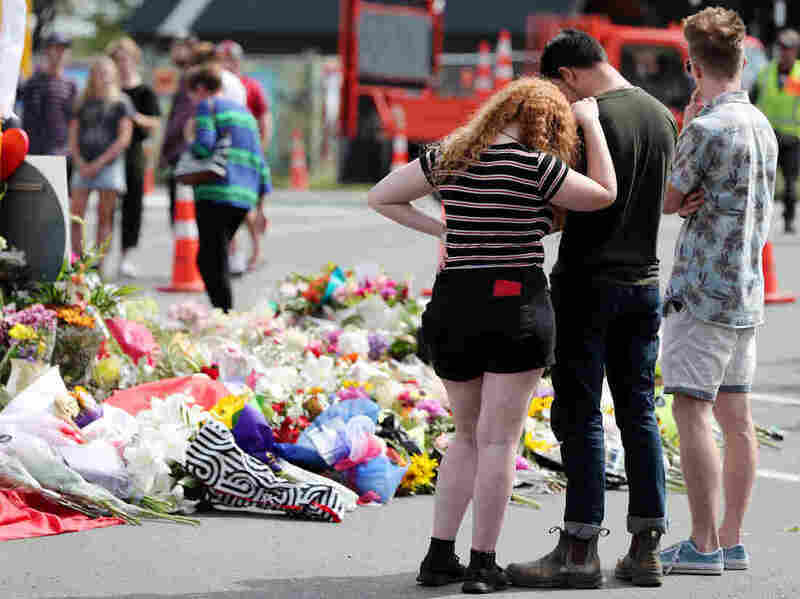 Children, Foreigners Among Those Killed In Attacks On Christchurch Mosques A 3-year-old girl is feared dead after Friday's attack. New Zealand's prime minister has said most of the victims may be migrants and refugees. Residents pay their respects by placing flowers for the victims of the mosques attacks in Christchurch. People from at least half a dozen countries and young children were among the 50 people killed in shootings at two mosques in Christchurch, New Zealand, on Friday. Officials in New Zealand have not yet released the names of those killed or wounded, but Prime Minister Jacinda Ardern said on Friday that many of those "directly affected by this shooting may be migrants to New Zealand" or even refugees. "For them to come to what they thought was a safe country and end up facing a shocking incident like this is really sad to hear," says Marc Greenhill, news director for New Zealand's news website Stuff. The youngest person missing and feared dead is 3 years old, Greenhill tells NPR's Weekend Edition. A critically injured 4-year-old girl was also brought to Christchurch Hospital then transferred to an Auckland hospital, according to Greg Robertson, chief of surgery at the Christchurch hospital. Greenhill described "acts of heroism" and "selflessness" by the people attacked on Friday afternoon, including one man who was killed trying to disarm a gunman at the second mosque. Another victim, Haji Daoud Nabi, died trying to save a fellow worshipper, his son told an Australian newspaper. Afghanistan's embassy in Canberra named Nabi as one of two Afghans killed in the attack. The Sydney Morning Herald reports Nabi had left Afghanistan decades earlier and settled in Australia with his family. "He normally pushes somebody out of the way if anything [happens] like this — 'get away, go' — because he's used to Afghanistan," his son, Omar Nabi, told the Herald. "Just helping people is his main thing. It makes me feel like he wanted other people to live." Others from the Middle East and Asia were also killed in the attack, according to foreign government reports. Pakistan's Ministry of Foreign Affairs released a statement saying that six Pakistani nationals had died. At least three Bangladeshis were among those killed, AP reports, and the Jordanian Ministry of Foreign Affairs announced that four Jordanians had died. The dead also included four Egyptians, the country's Ministry of Emigration wrote on Facebook, as well as three Turkish citizens, according to President Recep Tayyip Erdogan. At least one Palestinian died, the Palestinian ambassador to Australia and New Zealand said in a statement. Mohamed Hassan, a journalist who lived in New Zealand for most of his life, says Muslims have been grieving alongside numerous other communities. "We know that there's been young Somalis that have lost their life, people of Turkish backgrounds that have been injured," he told NPR's Weekend Edition from the airport, on his way to Christchurch. "So all of these communities, and by extension their home countries, are mourning." Hassan said his own family was alive but that some of his friends were looking for their parents. "Inevitably, this is such a small community, so these people are going to be people who are familiar to us, even if we don't know them directly," he says. "There are going to be friends among that list." Families of victims described a long first night of waiting for information at Christchurch Hospital and Hagley College, where a community center has been set up. Javed Dadabhai told Stuff that he lost a cousin to the attack and didn't find out until 4 a.m. local time on Saturday. "It's very understandable that it's a slow process because it's got to be thorough," Dadabhai told Stuff. But he said some people are frustrated because "they want to get on with their grieving process. They want to receive their dead." Ardern said Saturday that she had met with relatives of the victims and their "key concern" was to have access to their loved ones' remains for burial. She also says New Zealand will make "weekly compensation" available to victims' dependents on an ongoing basis. The New Zealand Red Cross has published a list of missing persons on its website.